At Project AlphaLink, a novel aircraft concept for so-called High-Altitude Platforms (HAP) is examined under flight mechanical and flight control aspects. In this concept, several individual aircraft form an aircraft formation with a large wingspan. They are coupled to each other using joints at the wing tips. Due to the large wingspan, the induced drag is significantly reduced. Since the joints do not transfer any bending moments, this concept has a significant advantage compared to conventional concepts with a continuous wing. Aircraft called High-Altitude Platforms (HAP) have been studied as a cost-effective supplement to expensive satellites for several years. They shall be used for similar communication and monitoring tasks that currently require satellites. The current concepts of such aircraft, which have already been used successfully in flight tests, include the Helios of AeroVironment or the Airbus Zephyr, which has flown continuously for more than 336 hours. All of these HAP aircraft have a high-aspect-ratio wing in lightweight construction. This construction method results in high bending moments and high structural loads in gusty atmosphere, which can lead to overloads and aircraft accidents. To overcome the shortcomings of such single-wing aircraft, so-called multibody aircraft are considered an alternative. The concept is based on many aircraft connected at their wing tips. They climb individually to the operational altitude, where they form a formation with a large wing spand and a high-aspect ratio. As a result, the drag of the overall formation is reduced and no bending moments are transmitted by the joints. This has the advantage that even with formations of very large wingspans, the structural weight remains low, but the payload capacity increases. As part of the Project AlphaLink, such a multibody aircraft is designed with regard to flight performance aspects, the flight dynamics are analyzed. and a flight controller is designed for automatic flight. The multibody aircraft concept offers significant advantages in operation as HAP. The individual aircraft climb independently to the mission altitude. They pass the troposphere, where the active weather takes place. Due to their moderate wingspan, they are less prone to gusts and turbulences than HAP aircraft with a large single wing. At the mission altitude of 20-30 km, the individual aircraft are coupled successively, forming an overall formation with a high-aspect-ration wing. 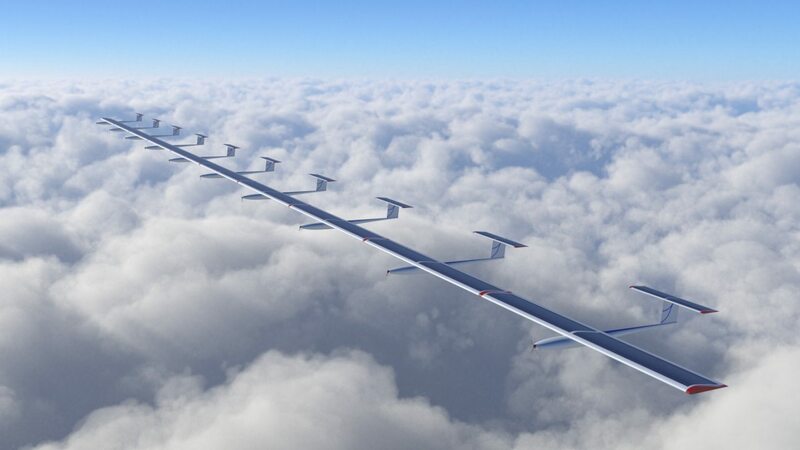 As a result, the multibody aircraft achieves its superior flight performance and can use solar energy to meet its energy needs on a permanent basis. The modularity allows for the very first time a real long-term operation, since maintenance work is carried out during flight. Individual aircraft can be decoupled and replaced, if necessary. It is also possible to couple single aircraft used as battery modules. The scalability of the multibody aircraft technology allows the variation of the number and size of the individual aircraft modules and, thus, the adaptation of the aircraft configuration to specific mission purposes. Further, formations with individual aircraft of different size are possible. Compared to classic satellite technology, multibody aircraft operated as HAP can be positioned more quickly and flexibly. They are also reusable, as they offer the opportunity for simple mission changes and can return to the ground station once their initial mission is completed. In operation in the stratosphere, they take on tasks in the areas of communication (Internet, mobile telephony) and earth observation. In general, further applications include operation in smaller formations in near-earth surroundings. The requirements for the design are the specifications of the US DARPA Vulture program. An aircraft configuration is requested as a high-altitude platform capable of carrying a payload of 450 kg over 5 years with operation within the 40th north and south latitudes. These requirements are the mathematical criteria of quality for the multibody aircraft and represent the design requirements. By using joints that allow different roll and pitch angles of the aircraft with respect to each other, this additional degree of freedom can be incorporated into the design. Since no bending moments are transferred, it is sufficient for each aircraft to be designed as rigid. The subsequent design of the multibody aircraft is implemented in a fully non-linear flight dynamics model. Here, the mechanical coupling of the aircraft is taken into account. The overall formation has a total of 12 rigid body states and the coupling of one aircraft produces four further state variables. In the flight dynamic analysis, the influence of these additional coupling states on the movement of the rigid-body aircraft is investigated, in particular the classical flight mechanic eigenmotions. A further important aspect of analysis is the positioning of the joint. Overall, the dynamics of the controlled system is a strongly coupled multi-variable system. The flight dynamics model is then used for the controller design. If possible, a conventional structure shall be used. The inner-control loops and the wing-shape controller stabilize the controlled system. The outer-control loops are used to control the trajectory. For the inner-control loops, approaches used for classic multi-variable control systems are applied. The coupling itself leads to geometric nonlinearities whose influence must be taken into account within the control design. A flight mechanical design of a multibody aircraft is available. The design fully complies with the flight performance requirements of the DARPA Vulture program, i.e. a total payload of 450 kg distributed on 10 aircraft can be transported one-year-long with the available solar energy at 40 degrees latitude. In addition, further flight mechanics parameters were identified, which increase the flight performance of a multi-body aircraft. These include the optimal wing shape and the specific position of the joint along the wing tip. The completely non-linear flight dynamics model of aircraft coupled through mechanical joints was established. The joints allow for rolling and pitching motion between the individual aircraft. The model was used to study the effect of these additional degrees of freedom on flight dynamics, particularly the rigid-body motion. Flight control laws have been developed that use two inner-control loops to dampen the modes of the coupling as well as the classic eigenmotions of flight mechanics, thus maintaining the desired wing shape. This provides the outer-control loops with a quasi rigid aircraft, so that classical flight control approaches can be used for the outer-control loops. To check the flight controller, a technology demonstrator was built, consisting of three connected aircraft with a wingspan of 140 cm each. Implementation of the concept required the design of a flight control system that would capture the relevant measurements, as well as the pilot's inputs via the RC remote control, calculate the flight control laws and set the actuators for the aircraft based on the calculations. A wifi connection was used to establish communication between the aircraft. 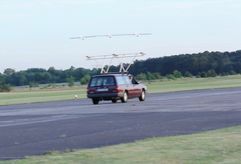 This technology demonstrator was tested in June 2017 at the airfield in Strausberg. It was shown that the regulation for holding the wing shape can be successfully implemented. In the next step, the multi-body aircraft will be tested in a practical application. For this purpose, a prototype consisting of three connected aircraft modules is set up. The payload is designed so that variable communication and camera equipment can be transported. In the long run, the multibody aircraft technology shall be operated in the stratosphere: www.AlphaLink.space.